Being a goalkeeper is no easy gig. Make a mistake, and it almost always results in a goal for the opposition. 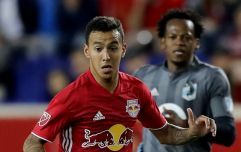 Those watching the Major League Soccer contest between New York City FC and Minnesota United on Saturday night were reminded of this point by Sean Johnson, who produced one of the most incredible howlers you'll see all season.